Palmer: I'm not killing anyone in cold blood. Ross: Then provoke him, if that satisfies your scruples. You really have to wonder, without the Russian Communists, what would British and American secret agents have done all through the 1960s? I tell you honey, if it ain't from Russia with love, send it back! Surely it must have a return address. What? There is none? Oh, fine, throw it in the garage. 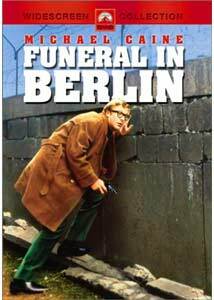 Anyway, if you're into 1960s spy movies, you might like Funeral In Berlin. After all, it is from the director of Goldfinger, Guy Hamilton, and it features Michael Caine, that guy from Jaws 4: The Revenge. Instead of camping it up like he did with Bond, Hamilton plays it straight here. Unfortunately, Hamilton seems to have left the excitement with the camp, making Funeral In Berlin about as interesting as that self-same black tie ceremony. Michael Caine plays Harry Palmer, an ex-crook who is working for Her Majesty's Secret Service instead of doing jail time. His latest mission is to get a Russian colonel by the name of Stok out of East Berlin, because Stok wants to defect. Of course, not everything is as it seems, and the plot quickly thickens to the consistency of chunky gravy, the kind everyone hates. There's really no point in describing the plot past the basic premise, it will only confuse you and make you hate me for putting it down in print. As far as spy movies go, this one is bad. There's not one moment that sustained my interest whatsoever. First of all, we have no investment in the characters. Palmer comes off as a smart-alecky wiseass, bumbling around Berlin, hoping he bumps into someone who can help him, but finding trouble instead. Since this isn't a comedy, and because Palmer is supposed to be a secret service agent, his way of acting doesn't make the audience think much of him, and—much like Laurie Strode in Halloween who never checks to see if Michael Myers is dead—deserves everything he gets. Also, do you really think that the British secret service would be using an agent of such dubious origins on such an important mission? In one scene, Palmer is asked why he isn't in jail, and his reply is something to the tune of, "They thought throwing such a talented crook in jail would be a waste." If he was such a good crook, how did he get caught, and if he was so good, why does he botch up the job beyond all recognition? Also, the ever-thickening plot doesn't help matters. Instead of including exciting action/car chase/jail escape/etc. sequences, Hamilton decides that he will raise the tension by adding another plot twist. All this does is raise the confusion level, not the suspense. As soon as you think you know what's going on, the whole movie shifts on you, and you don't know what the heck anyone is doing or why. And these aren't plot twists that take your expectations and then turn around in the opposite direction, these are plot twists that veer off into uncharted territory that we, as an audience, didn't even know was there, with no regard to what our previous expectations were. It's as if it was written by a committee of eight-year-olds trying to "one up" each other, trying to see who can come up with the most absurd plot contrivance. As it is with many Michael Caine films, Michael Caine is the best part. While I don't particularly care for the character of Harry Palmer, Caine has enough charm to sustain our interest and make his decidedly unfunny one-liners bearable. The other actors don't do too bad a job, even though Paul Hubschmid overacts a bit, and Eva Renzi is really just a nod to the "Bond girl" convention, despite attempts to make her something more. In the end, it's Michael Caine who carries this film, and it's Michael Caine who is the only factor in this film that rises above the mediocre level (although Eva Renzi did look particularly stunning in the underwear she was modeling). And finally we come to the score. The dreadful score that unwittingly provides the only true humor in the film. I have to say, I hate those 1960s jaunty faux-jazz big band scores. They sounded dated at the time, and they sound worse now. While I hate those scores in general, I sincerely don't know why one appears in a spy film. Maybe that's why the movie isn't suspenseful. Instead of music that fits the events, we get a rollicking score that just wants to take you for a ride on a merry-go-round. The lack of subtlety present here is truly hilarious. Whenever Palmer is with Eva Renzi's character, the score becomes lush and romantic, seemingly out of nowhere. In fact, there is one scene where the lush score only comes in at the end, as the scene is fading out to a non-romantic one. I don't understand the logic of the score, it is wholly inappropriate and only adds to the smoldering failure that is Funeral In Berlin. Image Transfer Review: Funeral In Berlin is presented in an anamorphic transfer, shown in its original aspect ratio of 2.35:1. Kudos to Paramount on this one. The movie is virtually spotless. There's hardly even any grain. A few of the darker scenes lack some detail, and there's a scene in a German nightclub where the color balances look off, but other than that, this is a very impressive transfer. Audio Transfer Review: The audio doesn't fare as well as the video. This mono mix isn't particularly good. The score is thankfully soft, but probably softer than the filmmakers intended. The dialogue stems, which always seem to be the biggest problem in any mix, seem dated here, although not as dated as some movies I've heard. The sound effects come off the best, including the machine gun with the obligatory bullet that crashes against something and goes ricocheting away (you know, "Bang! Bang! Kapow! Pa-ting!"). Extras Review: An unremastered fullscreen trailer. Wonderful. Also, why is it so hard to add more chapter stops? The more, the better. Twelve is inadequate. We want three-minute chapters, not twenty-minute chapters. A spy movie without excitement, humor, or a good score. What else could you ask for? I know I'm excited. Can some kind-hearted reader please send me a copy of Dr. No? It would be much appreciated.